How the hell did those two knuckle heads know where to go ??? Well it was easy, I got the hot tip from coach Dave Hodges. We looked at the wind forecast and the tide charts, the gears started turning in Dave’s head…. He said go left for current relief heading out, and right going in, Sweet… we had a plan. We had a decent start with a little puff that pushed us ahead of most of the fleet, then stopped dead and rolled by everyone. But we had a plan and we where sticking to it. So, we slowly worked are way to the south tower following the Wolf Pac A- loot- trash [editor side note: this is a reference to Andy Hamilton, owner of Moore 24 Barbaloot, Pete Trachy owner of Moore 24 White Trash, sailing on their new Donovan 30 Wolf Pack]. Tacked and headed in toward mile rock, we had just enough pressure to keep us moving forward. About half way to mile rock we looked back, and most of the fleet was going backwards. Dude it’s working, we need beers and tunes, so I jump down below to queue up some Bob Marley and grab a couple cold ones…… poooooooof, the manual cord on my PFD had come out and got snagged on the hatch. Mike was laughing in my face before the thing could fully inflate. No problem I have a spare cartridge I’ll just do I quick reload, oh wait its in the truck!!!! So we made it out of the bay with the Wolfpack and Banditos ahead us, flopped over to port and the drag race began. We were a bit over powered with the J2 and that mixed sea state was terrible, but we made it work. Banditos was to in front and leeward of us, they where blocked by the jib so we didn’t have constant visual with them. We sent it straight out the main channel, by the time we got to close to the last mark I look over and see Banditos way low. We looked at the chart plotter, we were right on course. I don’t know why they went so low, But thanks John for the early x-mas gift. We tacked at the Lightship with the Condor and headed off to mile rock. When we got about a quarter mile for mile rock we saw something going on with the condor, we were about set but held off for a few minutes to see what was going on, didn’t hear any chatter on any of our 3 radios. After a few minutes they got it together a sailed off. So, we set, had to gybe to clear the south tower, then back to starboard for finish. Mark English and JP Sirey on Mas! Great battle in the CCW direction with each of us leading for periods. We footed from it to south Hampton to steal the lead from 66. Then out of the distant past comes 85 who went really high after the Berkeley pier and SMOKED us by a 1/4 mile at RR. GANNET only sailed 1700 miles this year. I checked back to see what I wrote to you a year ago and I did what I said I might do then. In January we sailed from Marathon, Florida, to Hilton Head Island, South Carolina, covering 500 miles in three days, including GANNET’s best noon to noon run of 185 miles. Moore 24 gathering at Misfits Flat on September 7, 8, and 9. Lester Robertson and Mary have 3 manta twins, and 4 Manta Singles singles, along with 4 other Fiberglass French landsailers for the use of all. When boats get spread out on the racecourse and you lose sight of your competition, you never have a true sense of your standing in a race. It’s not until you see the results posted that you find out how well you really performed. That’s how the DHF was for us and the end result was better than we ever thought. The forecast was ugly early in the week. Rain and more rain. We certainly need it but on a Roadmaster weekend? The skiers in the crowd were certainly stoked!! John Gray aboard Immoral was on his home turf defending his dominating 3 Bridge win. 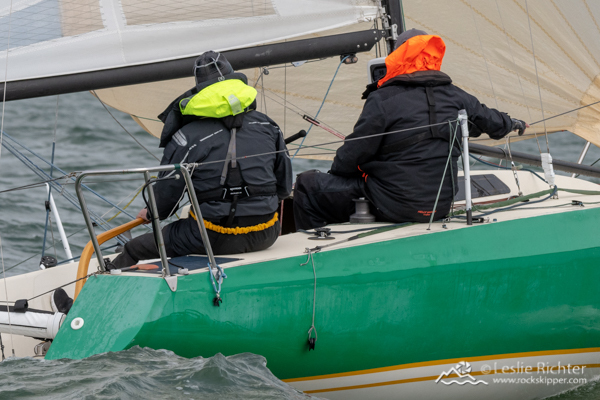 Local hotshots Banditos, MooreWave*Ohs, and Vaughn Seifers dusting off Flying Tiger were lined up to give a master class in sailing the Circle. It started out with all things going the "right" way. We had carved out a tiny block of time on Friday afternoon to prep the boat, which included spending an hour trying to fix existing (“I swear they worked 6 months ago!”) running lights, before giving up and buying the last set of tape on junk from West Marine just before closing time. Holy bejeezus that was good times! My affinity for the little old Moore 24 is no secret and her infamous beginnings not with standing she’s proven to be a boat that brings together some serious fun loving people. I mean seriously, who would have thunk that a sailor that ruined a good mold burning party by stealing the mold would end up making modifications to this remarkable boat that turned it into an unparalleled inshore and offshore platform that over 40 years later is still capable of taking a serious beating for 3 straight days while bringing together sailors that are more like family than on course rivals.